Patch Adams is a 1998 semi-biographical comedy-drama film starring Robin Williams, Monica Potter, Philip Seymour Hoffman and Bob Gunton. Directed by Tom Shadyac, it is based on the life story of Dr. Hunter "Patch" Adams and the book, Gesundheit: Good Health is a Laughing Matter, by Dr. Adams and Maureen Mylander. Despite being poorly received by critics and Dr. Adams himself, the film was a box-office success; grossing over twice its budget in the United States alone. Hunter "Patch" Adams (Robin Williams) is suicidal and admits himself to a mental institution. Once there, he finds that using humor, rather than doctor-centered psychotherapy, better helps his fellow patients and provides him with a new purpose in life. Because of this, he wants to become a medical doctor, and two years later enrolls at the Medical College of Virginia (now known as VCU School of Medicine) as the oldest first year student. He questions the school's soulless approach to medical care, as well as the methods of the school's Dean Walcott (Bob Gunton), who takes an instant dislike to Patch and believes that doctors must treat patients his way and not befriend them. Because of this and incidents such as setting up a giant pair of legs during an obstetric conference, he is expelled from the medical school, although he is later reinstated when it becomes apparent to the school that his unconventional methods often help cure his patients. Adams encourages medical students to work closely with nurses, learn interviewing skills early, and argues that death should be treated with dignity and sometimes even humor. Patch begins a friendship with fellow student Carin Fisher (Monica Potter) and develops his idea for a medical clinic built around his philosophy of treating patients using humor and compassion. With the help of Arthur Mendelson (Harold Gould), a wealthy man who was a patient whom Patch met while in the mental hospital, he purchases 105 acres (425,000 m²) in West Virginia to construct the future Gesundheit! Institute. Together with Carin, medical student Truman Schiff (Daniel London), and some old friends, he renovates an old cottage into a clinic. When they get the clinic running, they treat patients without medical insurance and perform comedy sketches for them. Patch's friendship with Carin soon turns into romance. When she tells him that she had been molested as a child, Patch comforts her and reassures her that she can overcome her pain by helping others. Encouraged, Carin wants to help a disturbed patient, Lawrence "Larry" Silver (Douglas Roberts). However, Larry murders Carin, then commits suicide. Patch is guilt-ridden by Carin's death and begins to question the goodness in humanity. Standing on a cliff, he contemplates suicide again and asks God for an explanation. He then sees a butterfly that reminds him that Carin had always wished she was a caterpillar that could turn into a butterfly and fly away. The butterfly lands on his medical bag and shirt before flying away. With his spirits revived, Patch decides to dedicate his work to her memory. Walcott eventually finds out that Patch has been running a clinic and practicing medicine without a license and attempts to expel him again because of this, as well as complaints that he has made his patients uncomfortable (which is obviously not true). Desperate to prove Walcott wrong, Patch files a grievance with the state medical board on the advice of his former medical school roommate, conservative Mitch Roman (Philip Seymour Hoffman). Patch succeeds in convincing the board that he must treat the spirit as well as the body. The board allows him to graduate and he receives a standing ovation from the packed hearing room. At graduation, Patch receives his diploma and, bowing to the professors and audience, reveals his naked bottom. Robin Williams as Dr. Hunter "Patch" Adams, initially a mental patient, who wishes to change the way doctors think and treat their patients. Daniel London as Truman Schiff, Patch's best friend and most loyal follower, in medical school. Philip Seymour Hoffman as Mitch Roman, Patch's uptight roommate, who initially clashes with Patch, but later joins his cause. Bob Gunton as Dean Walcott, rigid dean of the Medical School, who locks horns with Patch right from the start. Monica Potter as Carin Fisher, a serious medical student, who is later touched by Patch's passion. Josef Sommer as Dr. Eaton, professor at the Medical School, who does appreciate Patch's efforts. Harold Gould as Arthur Mendelson, wealthy mathematician who is in the mental hospital, and initially coins Patch's nickname. Harve Presnell as Dean Anderson, head of the Medical School; more tolerant of Patch than is Walcott. Michael Jeter as Rudy, Patch's roommate at the mental hospital, who is sciurophobic (fear of squirrels). Harry Groener as Dr. Prack, a humorless doctor at the mental hospital and a colleague of Dean Walcott. Peter Coyote as Bill Davis, a dying, ill-tempered patient in the hospital, who eventually bonds with Patch, and accepts his fate with dignity. Douglas Roberts as Lawrence "Larry" Silver, a mentally disturbed patient, whom Carin tries to help, but he later murders her. The film was shot in three locations: Treasure Island, California (near San Francisco), Asheville (North Carolina), and the University of North Carolina at Chapel Hill. A diner was temporarily placed in Point Richmond (a neighborhood in Richmond, California) and served as the University Diner. Several interior classroom scenes were filmed on the campus of UC Berkeley. The film has several major departures from Adams' real history. One is that the character of Corinne is fictional, but is analogous to a real life friend of Adams (a man) who was murdered under similar circumstances. Another difference is the then 47-year-old Robin Williams portrays Adams as enrolling in medical school very late in his life, his older age even being brought up in dialogue. In reality, Adams started medical school immediately and his educational progress was quite normal for a physician: He graduated high school at 18, college at 22, and medical school at 26. The film was released on December 25, 1998 in the United States and Canada and grossed $25.2 million in 2,712 theaters its opening weekend, ranking #1 at the box office. After its first weekend, it was the #2 film for four weeks. The film grossed US$202,292,902 worldwide — $135,026,902 in the United States and Canada and $67,266,000 in other territories. The film received negative reviews from critics. Review aggregator Metacritic reported that the film averaged a rating of 25%, and currently has a score of 22% on Rotten Tomatoes based on 64 reviews with the consensus reading, "Syrupy performances and directing make this dramedy all too obvious." Noted Chicago Sun-Times film critic Roger Ebert gave the film one and a half stars out of four and wrote, "'Patch Adams' made me want to spray the screen with Lysol. This movie is shameless. It's not merely a tearjerker. It extracts tears individually by liposuction, without anesthesia." Robert K. Elder of the Chicago Tribune called Monica Potter "the best thing about the otherwise dopey Patch Adams." It received "Two Thumbs Down" on the television series Siskel & Ebert, with particular criticism towards the character of Patch, whom they viewed as "overbearing", "obnoxious" and "sanctimonious" as well as noting that they would never trust a doctor who acted like Adams does. Gene Siskel said 'I would rather turn my head and cough than see another moment of Patch Adams again'. He later singled it out as the worst film of 1998; it was the last film he gave a "Worst of" to before his death in 1999. Marc Shaiman's score was nominated for the Academy Award for Best Original Score. The film was also nominated two Golden Globe Awards, for Best Motion Picture – Musical or Comedy and Best Actor – Motion Picture Musical or Comedy (Robin Williams). The real Patch Adams has been openly critical of the film, saying that it sacrificed much of his message to make a selling film. He also said that out of all aspects of his life and activism, the film portrayed him merely as a funny doctor. At a Conference on World Affairs, he told film critic Roger Ebert, "I hate that movie." During a speech in 2010 at the Mayo Clinic, Patch Adams said, "The film promised to build our hospital. None of the profits from the film ever came to us, and so, basically 40 years into this work, we are still trying to build our hospital." [Robin Williams] made $21 million for four months of pretending to be me, in a very simplistic version, and did not give $10 to my free hospital. Patch Adams, the person, would have, if I had Robin's money, given all $21 million to a free hospital in a country where 80 million cannot get care." However, in another interview, Adams did clarify that he did not hate Williams, and Williams actively supported St. Jude Children's Research Hospital for several years. The terrible news of the passing of Robin Williams reached me here in the Peruvian Amazon late Monday night with tremendous sadness. Surrounded by over 100 friends and clowns on our annual clown trip, we mourn this tragic loss and continue to treasure his comic genius. Robin Williams was a wonderful, kind and generous man. One important thing I remember about his personality is that he was unassuming—he never acted as if he was powerful or famous. Instead, he was always tender and welcoming, willing to help others with a smile or a joke. Robin was a brilliant comedian—there is no doubt. He was a compassionate, caring human being. While watching him work on the set of the film based on my life—Patch Adams–I saw that whenever there was a stressful moment, Robin would tap into his improvisation style to lighten the mood of cast and crew. Also, I would like to point out, Robin would be especially kind toward my children when they would visit the set. Contrary to how many people may view him, he actually seemed to me to be an introvert. When he invited me and my family into his home, he valued peace and quiet, a chance to breathe—a chance to get away from the fame that his talent has brought him. While early in life, he turned to drug use and alcohol to escape, he replaced the addiction with moments of solitude to help cope with the stress that fame brought. This world is not kind to people who become famous, and the fame he had garnered was a nightmare. While saddened, we are left with the consequences of his death. I'm enormously grateful for his wonderful performance of my early life, which has allowed the Gesundheit Institute to continue and expand our work. We extend our blessings to his family and friends in this moment of sadness. Thank you for all you've given this world Robin, thank you my friend. Patch Adams was released on a Collector's Edition DVD on June 22, 1999. On August 16, 2016, the film was released on Blu-ray for the first time. 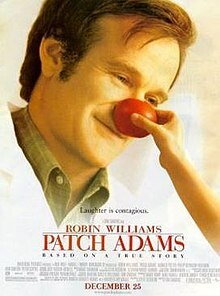 The soundtrack for Patch Adams was released on December 22, 1998 on CD and cassette by Universal Records. ^ "Patch Adams (1998) - Weekend Box Office Results". Box Office Mojo. Retrieved 2008-02-08. ^ "Patch Adams (1998)". Box Office Mojo. Retrieved 2008-02-09. ^ Patch Adams - MetaCritic. Retrieved 2009-06-06. ^ "Patch Adams". Rotten Tomatoes. Retrieved 2012-07-07. ^ "Patch Adams". Chicago Sun-Times. ^ Elder, Robert K. (February 2, 2001). "Monica Potter Almost Redeems `Head Over Heels'". Chicago Tribune. Retrieved January 13, 2014. ^ chalomirof63 (2011-02-17). "SISKEL & EBERT: "PATCH ADAMS" (1998)". YouTube. Retrieved 2012-07-07. ^ a b "Real Patch Adams - Movie True Story". Chasingthefrog.com. Retrieved 2012-07-07. ^ "Roger Ebert on Twitter". ^ "Il sorriso serio di Patch Adams "Non chiamatela clownterapia" - Repubblica.it". ^ "Celebrity Involvement at St. Jude". Stjude.org. Retrieved 2012-07-07. ^ "Patch Adams: 'Thank You for All You've Given This World Robin, Thank You My Friend'". ^ "Patch Adams - Collector's Edition". Amazon. Retrieved March 26, 2017. ^ "Patch Adams Blu-ray". Blu-ray.com. Retrieved March 26, 2017. ^ "Patch Adams - Original Soundtrack - Songs, Reviews, Credits - AllMusic". AllMusic. Retrieved 11 September 2017. This page was last edited on 17 January 2019, at 00:09 (UTC).